For views of downtown Seattle, the Space Needle, and Mount Rainier, the hilltop Kerry Park is hard to beat. Popular with photographers, Kerry Park looks out across the city skyline, the leafy streets of the Queen Anne Hill neighborhood, and Puget Sound, where you can spot ferries leaving the Seattle waterfront for the San Juan Islands. The view from Kerry Park is among Seattle’s most photographed scenes, and with good reason: It takes in beloved landmarks from the Space Needle to Bainbridge Island to Mount Rainier. Although the park itself is compact, it’s a worthwhile detour if you’re exploring Queen Anne Hill. Kerry Park is also included in some city sightseeing tours, including a half-day excursion that visits Snoqualmie Falls and major Seattle sights. The most popular vantage point for photography is to the park’s right as you’re looking at downtown Seattle. Many photographers prefer a zoom or telephoto lens when taking pictures from Kerry Park. Bring a tripod to capture sunset shots. Located in the Queen Anne Hill neighborhood, Kerry Park has three entrances on W. Highland Drive between 3rd Avenue W. and 2nd Avenue W. Street parking is available in the surrounding area. Several bus routes stop a short distance away at the intersection of Queen Anne Avenue N. and Highland Drive. The most sought-after views from Kerry Park are of downtown Seattle with Mount Rainier as a backdrop, but the scene only appears on clear days. Sunset is a popular time to visit, as well, so it’s worth arriving early to secure a good spot among the other photographers. At night, it’s an entirely different experience; come after dark to spot ferry lights on Puget Sound and the glittering Seattle skyline. What Can You See from Kerry Park? Even if it’s your first time in Seattle, you’re likely to recognize the Space Needle and Mount Rainier, both of which can be spotted from Kerry Park. If you’re scanning the skyline, however, there are more landmarks to be seen. Look for the Seattle Great Wheel on the waterfront; sunlight glinting from the Third Avenue Building; and the Columbia Center, the tallest building downtown. Capture the very best of Seattle on this city tour by bus. Your itinerary for the day includes many must-see spots, including Pike Place Market, the Central Waterfront, the Space Needle, and the locally sculpted Fremont Troll. Plus, this tour operates with a maximum of 15 people, ensuring you’ll enjoy a small-group experience from your expert guide. Check out Seattle’s latest attractions and hip culture on this 1.5-hour, guided sightseeing tour around the city. Drive by must-see sites like popular Pike Place Market, historic Pioneer Square and the iconic Space Needle. See Kurt Cobain’s former home as well as a certain floating house from the movie 'Sleepless in Seattle.' With lively narration and some of Seattle’s best music playing, this is sure to be a tour that is both educational and entertaining. Transportation by minibus. Hotel pickup is included for customers staying at downtown Seattle hotels, South Lake Union area hotels, or university area hotels. If you have just 1 day to dedicate to seeing the absolute best that Seattle has to offer, this is the tour for you! We'll spend the morning exploring Seattle's top city highlights including the Space Needle, Pike Place Market, the Chihuly Glass Museum, Kerry Park and Lake Union. In the afternoon, we'll escape the city and you'll get an amazing taste of the spectacular scenery that surrounds Seattle. At the foot of the Cascade mountain range, we'll stop for lunch in a quaint historic railroad town, feel the mists from thundering Snoqualmie Falls, and then cruise along a country road to the heart of winery country, where adults will enjoy a complimentary full wine tasting flight! Your group of up to 14 can start and end their tour anywhere in the greater Seattle area! Cruise terminal, Seattle hotel, Sea-Tac airport--it doesn't matter. Loaded with too much baggage after your cruise? We've got space for 20 suitcases so you don't have to worry about it! Transfer from your airport hotel to the cruise terminal — and tour Seattle in between — on this 3-hour pre-cruise city tour. See Seattle's most popular attractions, including the Space Needle and the original Starbucks, on this fully narrated excursion that includes pickup from your airport hotel and drop-off at the cruise terminal around noon. Your travel agenda in Seattle is probably jam packed! If you’re arriving in the morning to catch an afternoon Alaska cruise, or getting off that cruise in the morning to make an afternoon flight, we’ve got the perfect Seattle excursion for you. We pack the best of Seattle’s highlights into a manageable 3.5-hour excursion that starts wherever in Seattle that you need it to. Hotels, Sea-Tac Airport, or the cruise terminals—it’s all fair game! We’ll not only transfer your group up to 14 passengers, but take care of your luggage too if you’ve got it in tow. 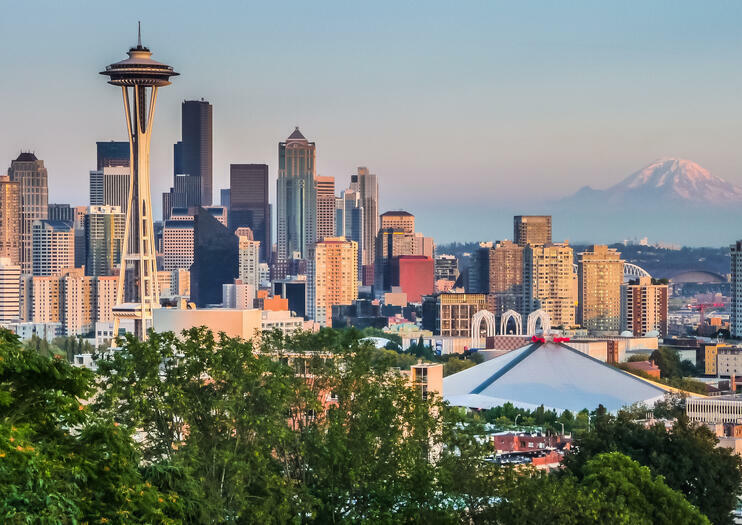 We'll spend this exciting half-day tour exploring Seattle's top city highlights including the Space Needle, Pike Place Market, the Chihuly Glass Museum, Kerry Park and Lake Union. At the end of the tour, we’ll drop you at your hotel, cruise terminal or the airport as needed. Going somewhere else, just let us know and we’ll discuss alternative arrangements.